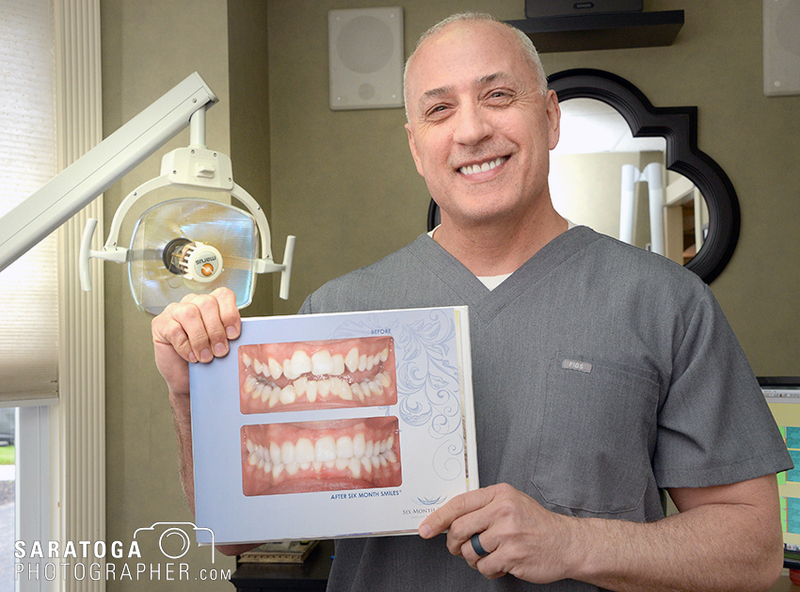 Richard L. Dennis, DMD, FAGD, of Saratoga Smiles in Saratoga Springs has implemented an adult orthodontic aesthetic treatment for straightening teeth and improving overall appearance. Richard L. Dennis, DMD, FAGD, of Saratoga Smiles dental practice on 176 Lake Avenue, Saratoga Springs, began implementing a new orthodontic alignment program less than one year ago, and it is rapidly gaining in popularity. The treatment program is an adult orthodontic aesthetic treatment that has proven effective in straightening teeth and improving overall appearance. While it shares certain similarities with traditional orthodontic procedures, it is less invasive and it uses tooth-colored wires and resin brackets. Like traditional orthodontics, patients in the Six Month Smiles program see Dr. Dennis every few weeks to change the wires and gauges. Unlike the Invisalign treatment, which has been around for several years and takes much longer to work, Six Month Smiles is true to its name, usually taking between six to eight months. The other notable difference between Six Month Smiles and traditional orthodontic or Invisalign treatments is cost. “This procedure costs about half of traditional orthodontics,” said dental hygienist Rachel Lyons, who has been with the practice for nearly ten years. She added that a typical Six Month Smiles treatment program usually costs about $3,400.00. Saratoga Race Course set an all-sources handle record with $676.7 million being wagered during the 40-day meet. Attendance reached 1,117,838, just off the record of 1,123,647 set in 2016. Crowds flock annually to the Saratoga County Business-to-Business Expo sponsored by the Saratoga County Chamber of Commerce. The event is scheduled for Oct. 5. 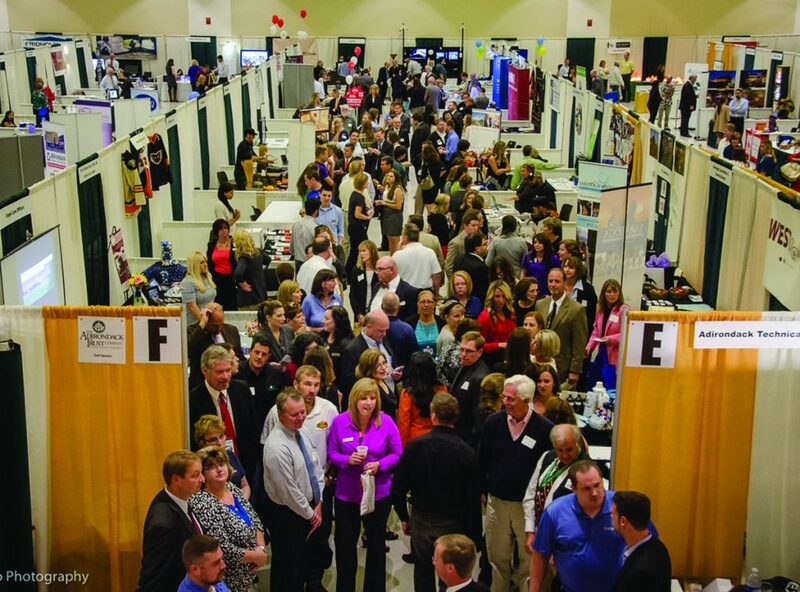 The Saratoga County Chamber of Commerce will host the 2017 Saratoga County Business-to-Business Expo on Thursday, Oct. 5, at the Saratoga Springs City Center. The event will start at 3:30 p.m. for members and vendors and at 5 p.m. for non-members. The event will conclude at 7 p.m. The Adirondack Trust Co. and Upstate Transit of Saratoga are the diamond sponsors of the Expo. Exhibitor space is always a sell-out with nearly 150 companies on hand to share ideas, products, and service expertise with other businesses in an interactive face-to-face trade show format, Chamber officials said. “The Saratoga County Business-to-Business Expo is the Chamber’s, and perhaps the Capital Region’s, largest business-to-business networking event of the year. With over 2,500 business professionals from all over the area, networking opportunities are plentiful if you are looking to build leads and grow your business,” said Todd Shimkus, Chamber president. The Adirondack Trust Co. has signed a letter of intent to purchase the assets of the Sutton and Tarantino Insurance Agency, an independent agency based in Saratoga Springs with a satellite office in Ballston Spa. The transaction is expected to close by Jan, 1, officials said. In addition to its banking operations, Adirondack Trust Co. operates two insurance divisions, the Adirondack Trust Insurance Agency in Saratoga Springs, and Amsure, based in Colonie. Sutton and Tarantino is recognized as a respected insurance agency which has represented individuals, families and businesses in the Saratoga County community since 1955, bank officials said. “I am looking forward to having my entire team of insurance professionals join the highly skilled insurance staff at the Adirondack Trust Insurance Agency,” said Rod J. Sutton, owner of the agency. Colin MacLean shows some of the different juices his company makes. Circus Café, 392 Broadway in downtown Saratoga Springs, has long been associated with a fun, family-friendly environment and a lively nightlife. In July, the restaurant was listed for sale by owners Colin and Christel MacLean. 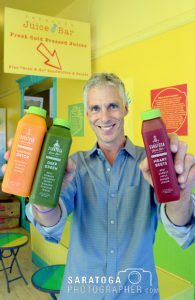 They plan to devote more time to their latest entrepreneurial enterprise, Saratoga Juice Bar, which is growing. Christel called the decision to open Saratoga Juice Bar another instance of “Saratoga serendipity.” She and Colin had just completed the purchase of the Crowne Grill and were absorbed in getting that restaurant off and running when, much to their surprise, the small storefront a few doors down that they’d been eyeing for months became available. “I went to Colin and said, ‘Guess what?’ We’re going to open a juice bar,’” she said. “We are always looking for ways to do something better or finding the next best thing,” she said. They determined the organic and all-natural juice business is a fast-growing across the country. Millennials are health conscious and baby boomers are looking for ways to stay younger. 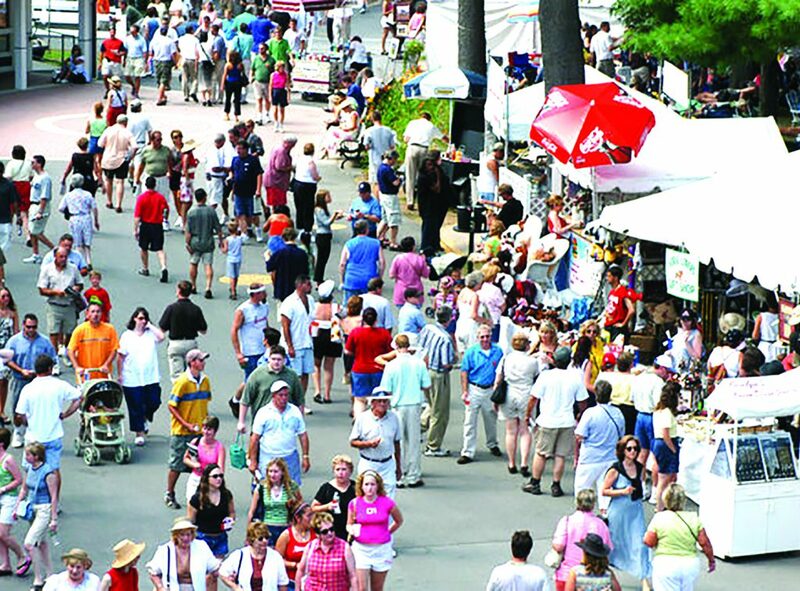 Saratoga County had also just been named the healthiest county in the state. It all made good business sense. Zouhir Lian poses outside his business, the Falafel Den, at 10 Phila St. in Sartoga Springs. The Falafel Den on Phila Street has moved, but only a very short distance, to a larger space. The establishment moved from 6 Phila St. to 10 Fila St., in the same block just off Broadway in downtown Saratoga Springs. The spot at 6 Phila St. was only about 100 square feet of space. It was mainly a takeout restaurant. Prior to being the Falafel Den, that location was occupied by Alpha Dogs, which specialized in hotdogs to go and had a few other menu options. 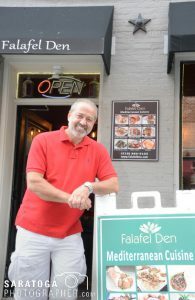 Falafel Den took the small space over in 2014, owned by Zouhir Lian. Lian was born in Syria and moved to the United States in 1990. He lived in New York City for many years before moving to Saratoga Springs in 2012. Soon it became obvious that Falafel Den would need more space. The 10 Phila St. location became available and Lian opened there in July. It has 400 square feet of space, which means room to accommodate many more people. “Our business has doubled so far since opening here,” said Lian. The inside is adorned in red and gold, with decorations and artwork on the walls. Colorful fabrics drape the counters. Deborah DePasquale says her new business, Toga Heritage, reflects her memories of childhood summers in Saratoga, like picnics, trips to the races and visits to Saratoga Performing Arts Center. Deborah DePasquale’s new business, Toga Heritage, reflects her fond memories of childhood summers in Saratoga: picnics and barbecues, trips to the races, learning to play golf, visits to the Saratoga Performing Arts Center, and sips from the mineral water fountains. The shop offers items from hats to picnic baskets to help capture that nostalgia. 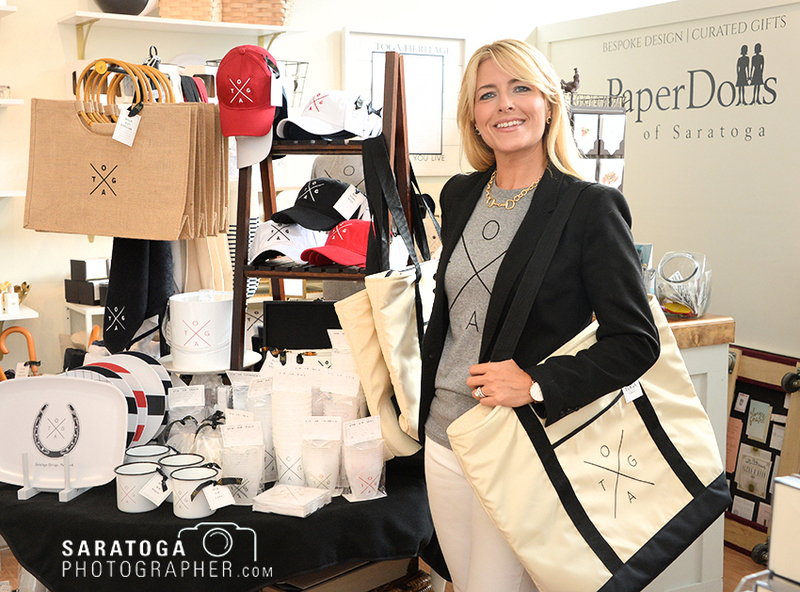 She calls it a “lifestyle business,” aimed at “locals and locals at heart.” Physically, it is a shop housed in part of the Paper Dolls stationery store in the Saratoga Marketplace at 454 Broadway in Saratoga Springs. “It’s my own shop inside of a shop,” she said. DePasquale said that she launched her brand in 2016, selling at polo matches, fashion shows and similar events. Some of the items she sells are manufactured under her own label. Others, she buys wholesale. David MacPhee is CEO of LeverPoint, based in Clifton Park, with clients all over the U.S.
LeverPoint, a company based in Clifton Park that provides accounting, tax preparation, payroll and similar services to private equity and venture capital firms, has seen “exponential growth” in the 10 years since it became an independent company, according to its CEO, David MacPhee. Its latest growth spurt came with the recent acquisition of Lamplighter Financial, a small California-based company providing similar services. MacPhee was part of a group of employees who bought a division of Ayco, a subsidiary of Goldman Sachs, in 2007. The company, which became LeverPoint, then had 18 employees. He said it now has some 150 employees and serves 108 clients with close to $50 billion in assets under management. 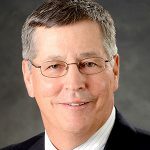 MacPhee became the company’s CEO in 2009. Aug. 7 was LeverPoint’s official anniversary date, but a party was held Aug. 25, with a Friday afternoon employee outing at Saratoga National Gold Course. He expects to add between 20 and 30 new jobs in the coming year, mostly accountants and CPAs. “We want to become the nation’s largest pure-play fund administrator in the not too distant future,” he said. 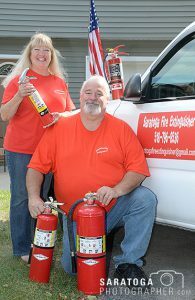 Fred Whipple and his wife Karen operate Saratoga Fire Extinguisher. Fred Whipple knows fire safety. From his family’s history with the Saratoga Springs Fire Department, to building his own career, he has been a part of the fire safety field for his entire life. Now, the retired firefighter is bringing his knowledge to his own business, Saratoga Fire Extinguisher. He said after retiring he wanted to still utilize his expertise via fire extinguisher sales and service. He specializes in portable fire extinguishers, emergency lighting and other safety products for business and residential customers. “I wanted to start this business to provide a service that is lacking locally. There are a few companies out there but none that are from Saratoga Springs,” said Whipple. He said state and local laws govern all public places and businesses in regard to fire extinguishers, and those extinguishers need to be serviced and inspected yearly by a trained professional company. 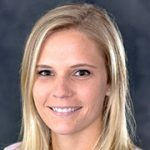 Roohan Realty in Saratoga Springs announce that Meghan McBride has joined the company as an accounting specialist. 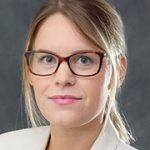 The company also announce the promotion of Eli King to digital marketing manager. She has been with the company for three years. McBride grew up in Mechanicville and received a Bachelor of Arts degree in psychology from Siena College in 2013. After school, she began her career in accounting. The role of digital marketing manager was created to support the growth of the company’s in-house marketing department, which also added a professional graphic designer to the team last month. King will manage the firm’s digital marketing strategies including the website, search engine optimization, original content, Roohan Beat newsletter, social media and interactive technologies. With over a decade of experience in real estate marketing and technology, King specializes in search engine optimization, content strategy and predictive analytics. She worked for a real estate firm in Lake George for several years before joining Roohan Realty in 2014. Eli, of Saratoga Springs, is a graduate of Manhattanville College. The Wesley Community announced that Timothy Pehl was appointed to the board of directors of the Wesley Community in Saratoga Springs. As a managing member at Luther Forest Wealth Advisors LLC and a senior partner at Kumlander, Donofrio, Hay & Pehl, CPAs, LLP, Pehl brings both comprehensive leadership and financial skills to the Wesley Community. Pehl currently is a member of the board of directors and past president of Saratoga Springs Lions Club Foundation Inc., as well as a long-time member of the Saratoga Springs Lions Club. 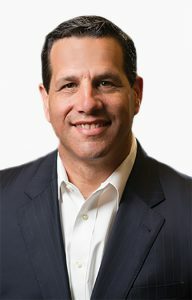 He previously served as chairman of the board of directors of the Saratoga County Chamber of Commerce and president of the board of directors of Transitional Services Association Inc., a Saratoga Springs-based nonprofit organization. He was treasurer and board member of the Saratoga Center for the Family. He is also the former treasurer of both the Gore Mountain Ski Club and Saratoga Springs Alpine Ski Team. A native and current resident of Saratoga Springs, Pehl is a graduate of Clarkson University.